Trojan.VBS.UEF is a clandestine Trojan that was created using the Visual Basic Scripting language. This dangerous threat does not need permission to enter your PC, and it uses fictitious software to conceal itself. Our malware researchers have found that the removal of Trojan.VBS.UEF is very important for your virtual security, which is why we have created this removal report. Read it to learn how to identify and delete this malicious infection. According to the most recent research, Trojan.VBS.UEF conceals itself behind the fake avast! Free Antivirus installer. The Trojan installs a malicious script, which can be used to download malware onto your operating system. Needless to say, this malware will also require removal if it managed to slither in. Unfortunately, not many computer users discover and remove Trojan.VBS.UEF in time, simply because they do not realize that it exists. Once installed, this infection will keep bombarding you with completely fictitious security alerts suggesting that malware has attempted to corrupt your PC. Unfortunately, even then users do not understand that they need to delete Trojan.VBS.UEF, as it informs that all security issues were resolved. Here is one example of a fictitious notification. 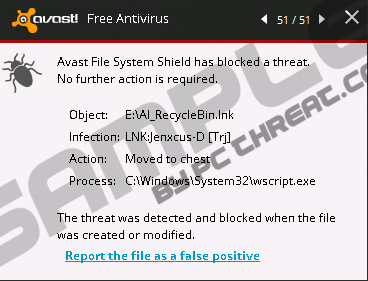 Avast File System Shield has blocked a threat. Trojan.VBS.UEF sets off false alarms so frequently that users immediately get frustrated. It is possible that this clandestine infection will then offer you to download fake upgrades or other malicious software. For example, you could be offered to install system optimization tools based on the fact that your PC slows down. Do you know what causes the decrease in system speeds? It is the Trojan itself, and we are sure that your operating system would start running normally as soon as you removed Trojan.VBS.UEF. The malicious Trojan.VBS.UEF is quite unpredictable, and it could use its concealment in various ways. If you do not want to encounter serious security issues, we suggest removing this threat from your Windows operating system right away. Keep in mind that you might have to remove Trojan.VBS.UEF-related threats as well. If one clandestine threat has managed to corrupt your PC, it is possible that you will need to delete an array of other threats. Needless to say, all malicious threats require urgent removal. The manual removal of Trojan.VBS.UEF is difficult, and you should not expect to succeed by performing one single removal step. Instead, you will have to locate and delete malicious files one by one, which is a highly complicated and tedious task. On top of that, the removal of Trojan.VBS.UEF-related threats might be just as complicated. If you are not experienced enough to handle this malware yourself, we suggest installing automatic malware removal software. This software will delete Trojan.VBS.UEF along with all other dangerous infections that might have slithered in. Most importantly, other malicious threats will not have a chance to enter your operating system with automatic malware detection and removal software guarding your operating system. Quick & tested solution for Trojan.VBS.UEF removal.